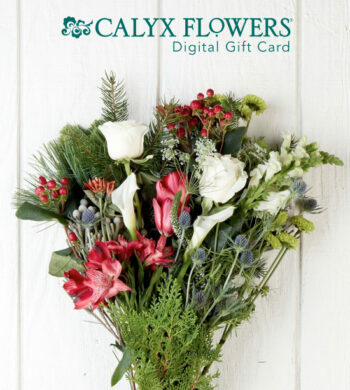 In our last post, we went over a few of our favorite flower gift ideas for those on your list who may be hard to shop for. We always love to find the perfect present to surprise our friends and family and there are so many creative choices. A meaningful gift can take many forms and it is often truly enjoyable to take time to mull over the options as you think about your loved ones. Silver Bells marks Christmas time in the city and now in homes as a lovely holiday gift. But every so often, time can slip away from us amidst the cookie making, holiday parties, and general hubbub of this busy season. Or, perhaps, you are having a hard time deciding on a gift for an acquaintance or friend who are far away and now’s the time to act. If that’s the case, not to worry! We have plenty of options for friends both near and far. Floral gifts are a great go-to in this situation. Not only do we have a diverse array of holiday flower bouquets, we take care in packing them so they arrive fresh and in bud form to bloom a few days after arriving to make sure your gift lasts. Flowers are a wonderful way to remind loved ones you are thinking of them, and our designer bouquets are arranged in gorgeous vases and cachepots that have been hand selected to coordinate perfectly with our luxury flowers. Our vases are so special and unique that your recipient will use them often, while remembering your thoughtful gift from this holiday season. Plus, our overnight shipping on all fresh cut flowers is always $15 so you don’t have to worry about breaking the bank while getting your last-minute shopping done. 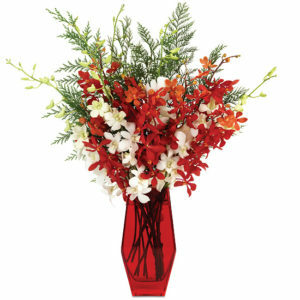 Merry Christmas Orchids guarantees bright and happy holiday colors with red and white orchids paired with fragrant cedar. If you’re envisioning a Christmas bouquet for the true traditionalist, our Silver Bells Bouquet captures the magic of the season. 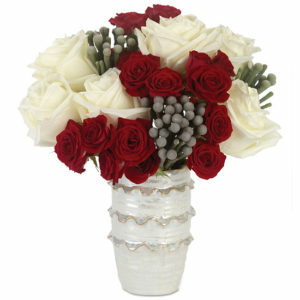 Silver brunia, which resembles little round silver bells, are a beautiful silvery-gray accent to the beautiful red and white luxury roses for a truly classic Christmas feel. These romantic and charming flowers are housed in a white ruffled ceramic vase with a silvery sheen that adds another element of texture and beauty. And it may have you or your recipient singing its praises as loud as the Christmas carol that inspired this holiday bouquet. Our Tropical Flair Bouquet is distinctively exotic while still staying festive for those who love a twist on the traditional. Orchid gifts are also an exquisite option that are luxurious and thoughtful. The striking look of orchids are always lovely to bring along to a party or to send to a friend as they always emanate elegance and beauty. We have a variety of holiday orchids, but perhaps our most popular orchid flower bouquet the Merry Christmas Orchids which pairs lively red mokara orchids with pale white dendrobriums, setting it apart from any other Christmas bouquet. The red and white orchids are accented with fragrant cedar, a traditional winter shrub, creating a classic Christmas palette that feels festive and traditional yet distinct. For something even further outside the box, tropical Christmas flowers are a fun twist on the traditional. 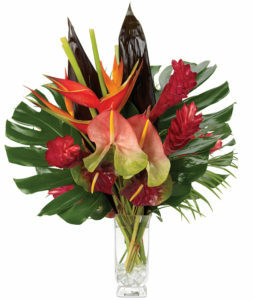 Our Tropical Flair Bouquet hits all the marks with exotic blooms in fiery reds, oranges and bright greens. Tropical flowers like red ginger and orange parakeets are incredibly festive without being overt which is perfect for a recipient who likes to see something a little different during the holidays. Avoid a dash through the snow by ordering a Digital Gift Card online! And if you’re selecting a gift for somebody who prefers to choose for themselves or you’re really down to the wire, our Digital Gift Card is here to save the day. Easily print the card off yourself and bring it to your next holiday gathering or have it emailed directly to the recipient for a nice surprise. Another bonus is that you get to skip all the lines and chaos that happens at a store while struggling to find a gift. Choose the amount that is right for you, for the recipient to use toward any item in our entire catalog. Your flower gift card arrives electronically with a customized gift message so it always feels special. We are always looking for ways to keep the holidays as fun and relaxed as possible so that you can enjoy what’s truly at the heart of these holidays: friends, family, and having a merry celebration. We hope some of these suggestions will help ease the stress when it comes to last minute holiday gifts!